Unknown - Can't read Thai! 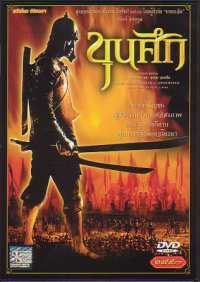 Film aka 'Sema, the Warrior of Ayodhaya'. Thai king Naraesuan holds a competition in order to find himself a new head warrior for his elephant-riding squadron, as his top man was killed by Burmese soldiers. Sema wins the competition an and is rewarded with the post, angering his rival Moo Khan, whose duties forced him to miss the contest. When Moo Khan's fiancee falls for Sema, the vengeful warrior snatches Sema's younger sister then withstands Sema's subsequent attack. Sema flees to the forest to live with a guerrilla band, redeeming himself later by saving the king from the attacking Burmese. Permitted to care for the army's elephants as a reward, Sema is unable to stand by while his compatriots are dying, and joins the battlefield.